Wing your way across the pacific toward Southeast Asia with arrival at Thailand. Arrive into Bangkok, where the innate friendliness and the hospitality of the Thai people await your presence. Your late evening arrival allows time for a night of rest and relaxation. Today’s flight carries you about the verdant jungle carpet to the city of Hanoi. Upon arrival, your private driver and guide will accompany you to your accommodation. 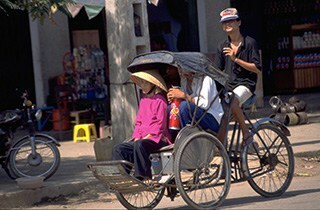 Begin your touring of Hanoi with a visit by cyclo (bike-driven cart) through Old Town along the “36 Streets” showcasing a wonder that is unique to Hanoi. Your carriage ride through this part of the city allows you a street-side view of a vast assortment of local kiosks, mobile eateries, and colorful sights that abound along the narrow lanes and alleyways tucked away in the central part of the city. This evening you are the invited guests for a performance of the famous Water Puppeteers. This morning, visit the square housing the Ho Chi Minh Mausoleum, his former private residence, the One-Pillar Pagoda and the Ho Chi Minh Museum. Enjoy lunch at one of Hanoi’s popular restaurants and thereafter, take a scenic drive across the countryside to Ha Long Bay, one of the more beautiful settings in all of Vietnam. The bay covers some 930 square miles and is dotted with a myriad of over 3,000 monoliths. Artists both young and old have tried to capture on canvas or in prose the dynamic and sensual beauty of this region. It will be for you to capture its beauty, either in memory or photograph when you cruise the waters of this spectacular bay. Begin your exciting day by private charter boat aside the hundreds of isles and monoliths that you will pass on your daylight cruise. Shades of emerald from grass and vine, tethered to stately monoliths project their sunlit glow across the placid waters of this peaceful bay. Lunch will be served as you sail the waters of the bay, followed by your drive back to Hanoi to enjoy an evening of rest and relaxation. 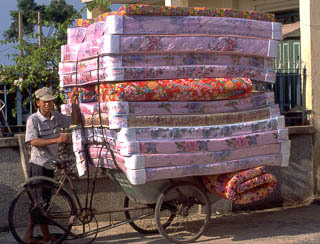 A morning stroll among the local residents who enjoy their sidewalk exercise completes your visit to Hanoi. 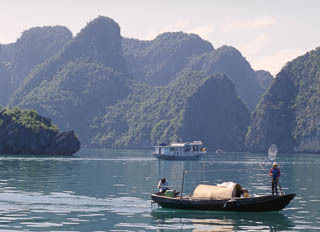 Fly to the city of Hué, considered by many to be the most beautiful of all cities within Vietnam. Upon arrival, drive across the countryside to the Kai Dinh Tomb, one of the more elaborate among Vietnam’s former emperors. 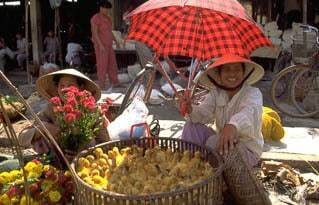 Stop by villages, where conical hats, incense sticks and duck raising are their means of livelihood. 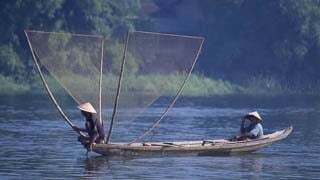 Board your private launch and cruise up the Huong Giang (Perfume) River to visit the Thien Mu Pagoda, perhaps the most famous in all of Vietnam. Continue by private boat to the Ming Manh Tomb. Completed in 1843, its design has elaborate bridges that link the various ceremonial halls, each surrounded by the magnificence of a beautifully landscaped natural setting. 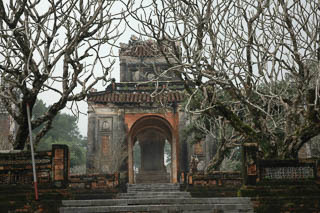 The Khai Dinh Tomb offers a completely different style with a European influence used throughout the interior walls. 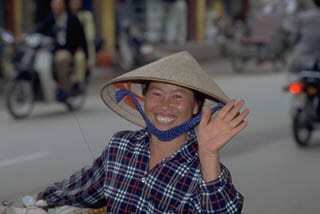 Enjoy a leisurely lunch in the town and thereafter, visit the expansive Citadel, the Forbidden City of Vietnam. A morning drive takes you south along the coastal highway across three mountain passes as you view the South China Sea, making your way to the town of Hoi An. Upon arrival enjoy a leisurely lunch in Hoi An, originally a seaport used by all in the Champa Kingdom and a trading port for all foreign merchants. Hoi An is a quaint town, where you will have a cyclo and walking tour that visits the Japanese Bridge, a Clan House, a Chinese temple and an abundance of shops that cater to both tourists and the local populace. This morning, visit Marble Mountains. Set along the South China Sea, they depict the harmony between mountain and sea, forming a splendid display of natural color. The staircase leading to the inner caves is your gateway to viewing a temple set within the center of the cave, with sunlight glowing downward from a natural skylight formed at the mountain top. Thereafter, visit the Champa Museum, where you will find an impressive display of statuary dedicated to the former Champa people who held vast territories within the Champa Kingdom. Lunch within the town followed by an afternoon at leisure. Fly to Saigon, a city like no other, which welcomes you to partake in all of its offerings, be they a beautiful temple in Cholon, a stroll through the city or simply the purchase of a silk garment as a memento of your visit. 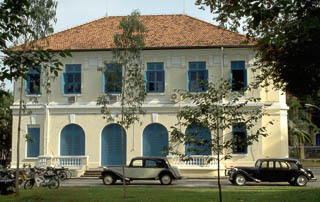 Upon arrival, begin viewing the city sights, including a visit to Reunification Palace, Notre Dame Cathedral, the colonial-styled architecture of the inner plaza and dockside, where the never-ending movement of boats ply the waters of the Saigon River, moving both passenger and merchandise to market. 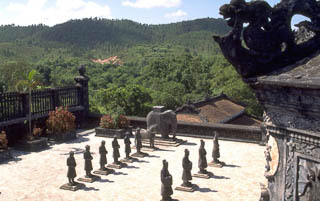 A morning drive takes you into the countryside to witness the ceremonies at the Cao Dai Cathedral, representing a blend of Confucianism, Taoism and Buddhism in a unique style of worship. 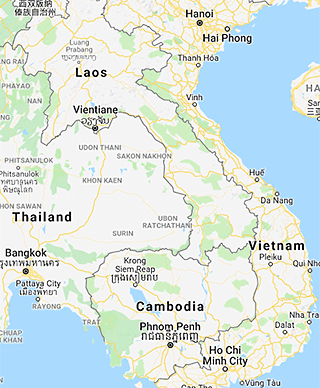 Thereafter, visit the region of Cu Chi, where you will be amazed at the size and breadth of the tunnel system used by the North Vietnamese to hide their weapons and forces during times of conflict. 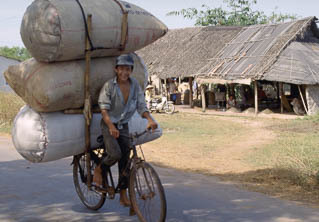 On return to Saigon, visit a rice noodle factory, providing an opportunity to observe the villagers using generations-old methods of gathering rice to sun dry and cut into noodles for use in Vietnam’s favorite cuisine. Enjoy a leisurely breakfast and at mid-morning depart for the airport to join your noontime flight to Siem Reap, Cambodia, site for the magnificence of Angkor. Upon arrival, your private driver and guide will accompany you to the hotel to enjoy a relaxing lunch. 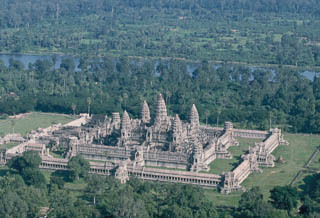 Later this afternoon, begin your exploration of this spectacular setting with a visit to Angkor Wat, the centerpiece of these world-renowned ruins. 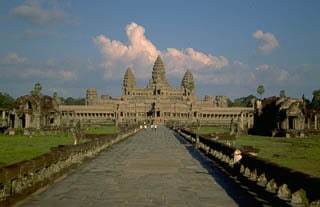 Today’s touring highlights the major sites at Angkor. 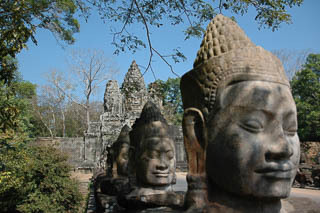 Drive through the forested region to visit Bayon, Angkor Thom and the Elephant Terrace. Each has its own history – its own fascination. Enjoy a lunch before traveling deeper into Angkor for a visit to Ta Prohm, which in particular is a photographer’s delight with much of the grounds encased in rooted Banyans, which have overcome the many walls and foundations on site. 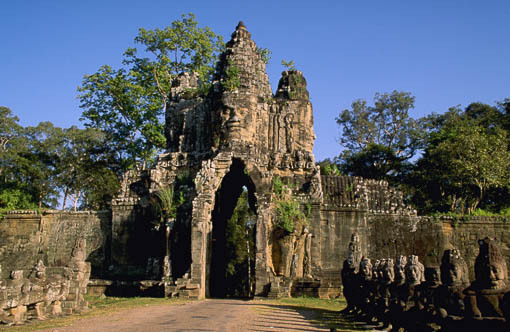 It is a remarkable temple ruins, one not to be missed and surely not forgotten. The day now completed, enjoy the remainder of the evening at leisure. 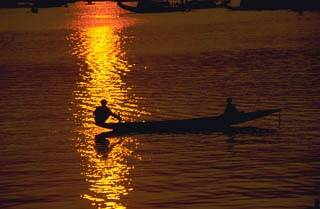 Complete your visit to Angkor with a private boat exploration of the stilted fishing villages along the waterway to expansive Tonle Sap Lake. Upon return toward Siem Reap, take a walking tour of a local village and thereafter enjoy a relaxing lunch within the city prior to your mid-afternoon departure to the airport for your onward flight to Luang Prabang, Laos. Begin your tour with a visit to the colorful Royal Palace, situated nearby the town center and built in 1904 during the French colonial era for King Sisavang Vong and his family. 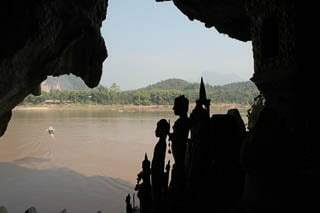 Thereafter, board your private launch for a journey up-river to the Buddha caves at Pak Ou. 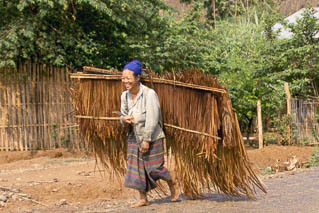 While traveling on the Mekong, you will have the opportunity to stop at a village to see a generations-old rice making mill and enjoy your stroll through the grounds to see first hand how villagers live their lives along the banks of the Mekong. 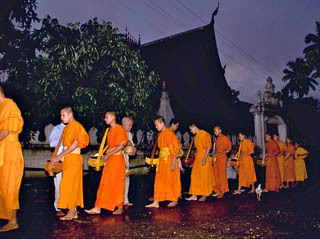 Your last morning in Luang Prabang offers a reward for the early riser who ventures to the river bank to witness lines of saffron clothed monks in stately procession as they walk along the narrow lanes of the town to receive daily offerings from the local residents who consider it their duty and their pleasure to present the monks with offerings of food. A visit to the silver market completes your stay at Luang Prabang. An afternoon flight wings you to the city of Bangkok for an evening of rest and relaxation. All too soon your holiday to Southeast Asia has come to an end and it is time to board your onward flight returning you home with those never-forgotten memories to cherish over a lifetime.